There are several aspects of the library community, and the vendors that serve that market, which set it apart from other industries. The mission-driven zeal to provide services to patrons is one element that is not prevalent in other markets. The notion that the work of libraries is part of the continuum of knowledge and that preserving information for future generations is a core service that libraries provide is also a mark of distinction. Yet another aspect of the community that sets libraries apart is its commitment to privacy and people's rights to intellectual freedom. In an age when more and more businesses derive their value from mining and exploiting information about a user's activity, the commitment to protecting people's privacy among libraries is truly unique. One challenge with the support for privacy from the library community is that many library services these days are not provided directly by the library, but by third parties. Book and journal content is provided electronically through publishers and content platform providers. Software service providers provide discovery and information management systems. There are a variety of other services that libraries contract for to support library patron services, most of which are not provided by libraries or library organizations. For the most part, the vendors of library services or content are interested in supporting the library community and their values, albeit from their own perspectives. This support is often co–mingled with other business necessities, realities, and priorities. To balance this support and the advocacy that the library community brings to the topic of privacy, NISO launched an initiative on privacy in library, publisher, and software-provider systems. The goal of this project is to establish a consensus framework of principles that proscribe how information systems should be created and managed in way that will respect the privacy of patron data. Can libraries and service providers develop valuable services that are based on user activity data, or improve existing services using activity data, in a way that simultaneously protects user privacy? After 8 months of virtual and in-person meetings, as well as a long series of editing teleconferences, the working group is close to releasing the principles resulting from its efforts. The work is in its last review phase and should be released in mid-November. Be on the lookout for them. We will set up a method by which people can affirm their support of the principles. We're also talking about the principles at a variety of community meetings this fall. Beyond this work, there are many projects that have been advancing significantly this fall. Some of those will be covered in Working Group Connections next week. We are also looking forward to some significant changes to NISO's staffing and programs in the coming year, which we are aligning now. It's been a heads-down fall at NISO, which will lead to a lot of announcements and implementation work in the coming months. Advancing understanding of technology in the information distribution community is a core element of NISO's non-profit mission. Over the years, thousands of information professionals have participated in our virtual and in-person educational programs. The coming year, NISO will continue to provide a robust schedule of monthly webinar series, virtual conferences, Free webinar events and Training Thursdays. Below is a list of the events scheduled in 2016. Complete information about the programs will be posted to the Events page on the NISO website in the coming weeks. NISO and the International Council on Scientific and Technical Information (ICSTI) are pleased to announce a new webinar partnership beginning this fall. The first program focuses on creating an ecosystem of Open Science. SOLD OUT FOR LIVE PARTICIPATION! 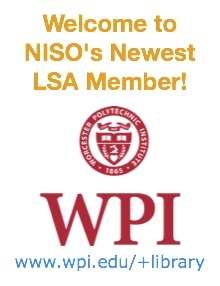 In June 2013, the Alfred P. Sloan Foundation awarded NISO a grant to undertake a two-phase initiative to explore, identify, and advance standards and/or best practices related to a new suite of potential metrics in the community. The NISO Altmetrics Project has successfully moved to Phase Two, the formation of three working groups: Group A—Focused on definitions and use cases, B—Focused on non-traditional outputs and persistent identifiers, and Group C—focused on Data Quality. Working Group B, led by Kristi Holmes, PhD, Director, Galter Health Sciences Library at Northwestern University, and Mike Taylor, Senior Product Manager, Informetrics at Elsevier, is focused on the Output Types & Identifiers within the alternative metrics landscape. For more information and to register for this free event THIS EVENT IS SOLD OUT! You can register to view the recording by visiting the event webpage. Everything about information resources and tools seems to be in a transitional state. We are building a new kind of digital information environment, dubbed the Semantic Web. This event looks at a spectrum of approaches adopted in developing semantically-enhanced information resources and provides attendees with a better sense of the rate of speed at which this community is moving to achieve the Semantic Web. In this December 2 virtual conference, co-sponsored by NISO and NFAIS, The Semantic Web: What's New and Cool to be held from 11:00 am-5:00 pm (EST ) you will learn the latest that's been going on in this quickly-changing space. The presenters will talk about the semantic web landscape, the role linked open data plays in this environment, and current projects underway that demonstrate how the semantic web impacts the library and information community, and what experts in the wider communities are doing to achieve those goals. For more information about the Virtual Conference and to register, visit the event webpage. New Work Item Proposal: Emergency Preparedness and Response for Cultural Heritage Th​is​ standard defines the steps of preparation to face emergency situations and defines the emergency response strategy. It applies to buildings where holdings are store and to the holdings themselves. Systematic Review for Notification of ISO 23081-1:2006 (vers 2) Information and documentation - Records management processes – Metadata for records – Part 1: Principles This ​standard covers the principles that underpin and govern records management metadata. These principles apply through time to:​ ​records and their metadata; all processes that affect them; any system in which they reside;​ and ​any organization that is responsible for their management. Systematic Review for ISO 9230:2007 (vers 2) Information and documentation -Determination of price indexes for print and electronic media purchased by librarians This International Standard specifies a method for the determination of price indexes relating to the prices of print and electronic media acquired by libraries. It is not meant for calculating a price index of the national media production. The media included are restricted to books, serials and databases. After several months of formulation and comment, the Library of Congress has posted a second version of its draft specification of the BIBFRAME vocabulary. There are seven “draft specifications” (targeted at different components of the vocabulary) posted on the Library of Congress Website. Specifically: Titles; Agents and Roles; Items; Events; Identifiers and Notes; Administrative Metadata; and Categories. Comment and discussion on these draft specifications is invited. A completed 2.0 version of the BIBFRAME vocabulary is expected in early 2016. "The ALCTS/LITA Metadata Standards Committee invites the library, archives, and museums metadata communities to comment on the document, Principles for Evaluating Metadata Standards. 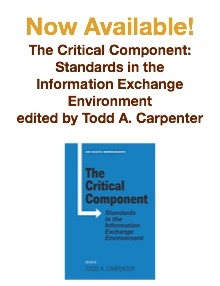 This document is meant to assist in the development, maintenance, selection, use, and assessment of metadata standards. The current draft incorporates feedback given on an earlier version of the document. The committee encourages written feedback through one of the following options: leave a comment on the Principles page or fill out the comment form." The W3C Web Annotation Working Group is chartered to develop a set of specifications for an interoperable, sharable, distributed Web annotation architecture. Annotations are typically used to convey information about a resource or associations between resources. Simple examples include a comment or tag on a single web page or image, or a blog post about a news article. The Web Annotation Data Model specification describes a structured model and format to enable annotations to be shared and reused across different hardware and software platforms. The specification provides both a conceptual model that accommodates common use cases, and the vocabulary of terms that represents it. The Digital Publishing Interest Group, whose mission is to provide a technical forum for experts in the digital publishing ecosystem to hold discussions and recommend solutions regarding a future vision of Digital Publishing. has published a Working Draft of Portable Web Publications for the Open Web Platform. This document introduces Portable Web Publications, a vision for the future of digital publishing that is based on a fully native representation of documents within the Open Web Platform. Portable Web Publications achieve full convergence between online and offline/portable document publishing: publishers and users won't need to choose one or the other, but can switch between them dynamically, at will. Note: this document outlines a general vision and should not be considered a technical specification. Instead, its goal is to outline that vision and the possible technical directions to achieve it. More detailed technical work should be detailed in separate documents. The International Organization for Standardization (ISO) recently released its ISO Strategy 2016-2020, detailing the organization's strategic direction over the next five years. The document serves as a guide for how the organization will interact with stakeholders and meet the needs of customers as technological, economic, legal, environmental, social, and political factors continue to influence standards and their utilization. The Strategy was approved at ISO's Annual General Assembly in Seoul, Republic of Korea, in September 2015, and pinpoints six major strategic directions, including: developing high-quality standards through ISO global membership; engaging stakeholders and partners; people and organization development; use of technology; communication; and producing globally relevant international standards "used everywhere." Emoji continues to be the fastest-changing area of Unicode, and the Unicode consortium has updated a number of web pages for these expressions. Updated resources include Emoji Candidates and Charts, the comprehensive list of all 67 emoji candidate characters that have been accepted by the UTC (Unicode Technical Committee) as candidates, but are not yet added to the Unicode Standard; Emoji Recently Added, the emoji characters mostly recently added to the Unicode Standard; and pages listing external resources with useful information about Emoji and media articles on Emoji. The UTC will be meeting the first week of November, and on the agenda will be additional emoji recommendations from the Emoji Subcommittee. Rapple summarizes the closing session of the 2:AM conference held October 6-7 in Amsterdam, which brought together the four authors of the altmetrics manifesto on one stage to ruminate on the altmetrics movement of the past several years and discuss potential directions and foci for the future. The article also includes references to other presentations from the conference and arguments on different applications for these new tools for assessment. NISO Note: The NISO Altmetrics Working Groups are creating recommended practices around different areas of Altmetrics. Working Group B (Output Types and Identifiers) is holding an open webinar on November 16. Article explains the motivations of the Semantic Web that information published should include markup to give it structural and semantic meaning, to support automatic linking information. 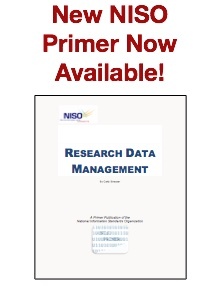 Includes a short history of linked data concepts, including RDF (resource description framework), RDA, the next-generation cataloging standard, and some potential applications in libraries. Future directions note the amount of attention that needs to be put to initiatives such as Linked Data For Libraries and LibHub. By Ellen Harvey. Book Business, October 21, 2015. The international Frankfurt Book Fair came to a close on Sunday, (October 18) ending a week-long gathering of authors, agents, and publishing leaders who shared optimism for the future of the book industry. Whether publishing professionals expressed their excitement for global publishing initiatives, discussed the promise of data-driven strategies, or noted the challenges of ebook pricing, many of the conversations at Frankfurt focused on the biggest trends shaping the industry.” Article links to various discussions and news coming out of the Book Fair, including notes on book pricing, publisher use of data, new branding for Springer, and global publishing initiatives. In the beginning of October, NISO hosted a forum on the future of Library Resource Discovery in Baltimore, MD. This meeting convened by the NISO Discovery to Delivery Topic Committee brought together about 100 community members to discuss current and future trends in library resource discovery and the future of discovery systems to expose content. Peter Murray, currently of Cherry Hill Consulting and a co-chair of the NISO Discovery to Delivery Topic Committee provided the closing keynote presentation. This is the prepared text of that talk. 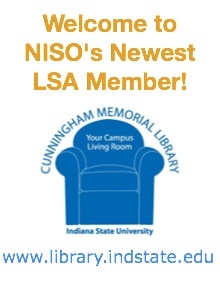 NISO Note: Peter Murray serves as Co-chair of the NISO Discovery to Delivery Topic Committe. In recent years open access Scholarly communication — though it has become widely adopted — is not fulfilling the aspirations of Web-based electronic communication, because it is still very difficult for potential users to discover. Different forms of open access publications may present unique impediments and incentives regarding discovery, which for most users takes place in well-known search engines. Library tentativeness in acquisition creates further barriers. Bonn calls for willingness for librarians to work across institutions to discuss and determine criteria for evaluating, selecting, acquiring, and managing OA publications in academic libraries, as well as for OA publications to provide high-quality native metadata to improve discovery. "Ultimately, we need to refrain from seeing OA as removed from the marketplace and thus unable to benefit from market mechanisms."